Visitors to Rovinj are often struck by its resemblance to Venice, its neighbor almost directly across the Adriatic Sea. The only thing that seems to distinguish “Little Venice” from its namesake is the absence of canals and busloads of tourists. July 2017, single image, additional exposures for highlights, focal length 24mm, aperture f/8, shutter speed 320 seconds, ISO 100, tripod. The similarity is not a coincidence. Rovinj, once controlled by both the Byzantines and the Franks, was regular victim of pirate attacks. Across the Adriatic, Venice eyed the city, which was then an island, as a possible outpost for their maritime empire. 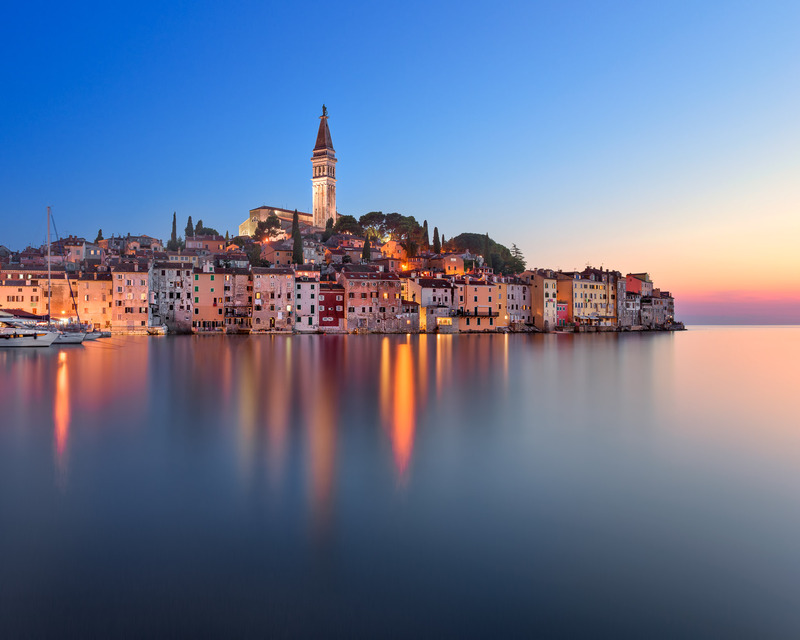 In 1283, Rovinj swore its allegiance to Venice in return for protection. This arrangement between Rovinj and Venice was never an altogether happy one. Though Rovinj was part of the Venetian republic from 1283 to 1797, its citizens were never fully accepted by the Venetians, who viewed them as inferior. In time, residents of Rovinj came to resent Venetian rule, even as they prospered courtesy of Venice’s protection. Nowadays, however, Rovinj is a Croatian city and the tensions with Venice are long-forgotten. Twenty-first century visitors to the city are the real beneficiaries of that long-ago relationship. Walking the streets of Rovinj, one sees the winged lion — the symbol of Venice — virtually everywhere. And the city’s most recognizable structure — the Church of St. Euphemia — is built in the Venetian Baroque style and was constructed as a twin to Venice’s own Campanile of St. Mark. As I position my camera to capture the city, I don’t think of faded empires or animosities between cities. I only marvel at the beautiful hybrid created by the fusion of cultures in Rovinj. This entry was posted in City and tagged Croatia, Rovinj.